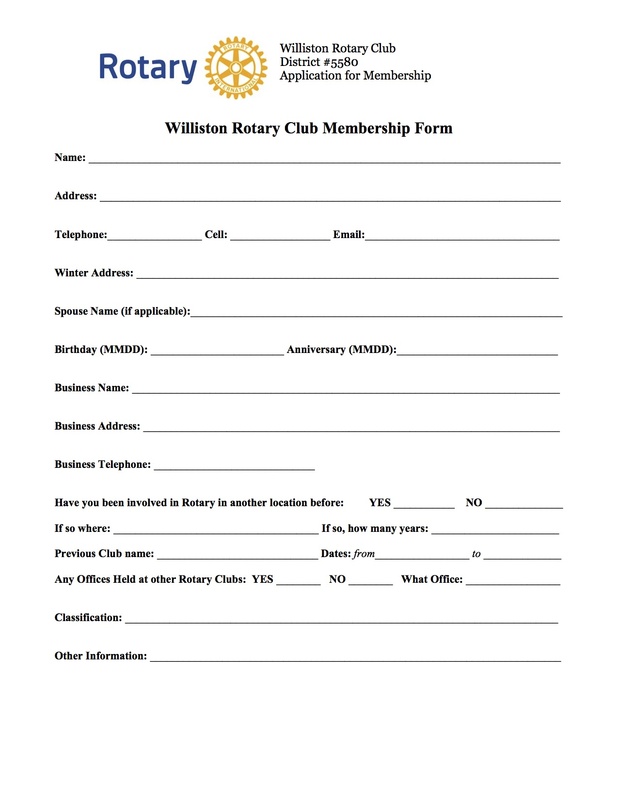 Become a Member of the Williston Rotary Club Today! Here is some information for your reference. We meet every Monday at 12pm at The Williston Restaurant. What we truly love about this organization is its commitment to “Service Above Self.” With over 1.2 million members worldwide, Rotary International is a worldwide network dedicated to service to others, promoting integrity, and advancing world understanding, goodwill, and peace through fellowship of business, professional, and community leaders. Most of Rotary's service tends to fall within one of the following six areas of focus: peace and conflict prevention/resolution, disease prevention and treatment, water and sanitation, maternal and child health, basic education and literacy, and economic and community development. If you have any questions, please let any Rotarian know. Thank you! As for mailers/newsletters, RI publishes a monthly magazine called “The Rotarian.” This publication outlines all the happenings of RI worldwide. Subscription to this is covered in your club dues. Other than that, the annual membership dues are $500 – this includes your meals, international dues, district dues, donation to Rotary Foundation, and the balance helps with operational expenses (for service projects, etc.). Click on the three downloadable documents on the left-side of this page. Once completed, please submit to the Club Secretary, Marsha Schmidt at the next weekly meeting. You are more than welcome to attend our meetings as a guest while your application is being processed. Then, you will be asked to participate in the New Member Installation Ceremony, as well as attend a Fireside Chat with our Board Members. Thank you and welcome to Rotary International!